Finally, in a single volume, a reference that presents engineering-level information on press-working sheet metal, die design, and die manufacturing! 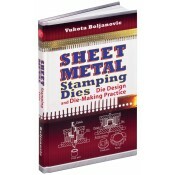 Concentrating on simple, practical methods, this book will be an invaluable resource for anyone looking for detailed information about die design and the manufacture of stamping dies, particularly practicing die designers, press engineers, tool and die maintenance technicians, students of die design, and advanced apprentice die makers. • Emphasizes the basic theory of sheet metal plastic deformation as an aid in understanding the manufacturing processes and operations that are necessary for successful die design. • Features the essential mathematical formulas and calculations needed for various die operations and performance of die design. • Provides a complete picture of the knowledge and skills needed for the effective design of dies for sheet metal cutting, forming and deep drawing operations, highlighted with illustrative examples. • Provides properties and typical applications of selected tool and die materials for various die components.